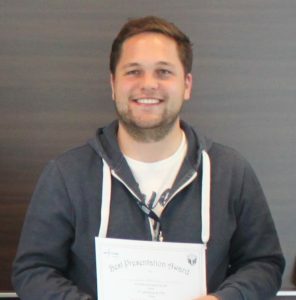 Nils Nöthling was awarded with one of the poster prizes during the 2nd STOE LabMeeting in 2017. This was as good as an excuse as any to ask him a little bit about his work. He did his bachelor and master studies at the University of Applied Sciences in Niederrhein where he specialized in Instrumental Analytics. After Nils finished his studies in 2015, he moved on to Bergische Universität Wuppertal and Max-Planck-Institut für Kohlenforschung where he is now developing new X-ray sources for future generations of crystallographers. He is quite a busy man as he is an active member in both, the Young Crystallographers and the Junganalytiker of the Fachgruppe Analytische Chemie der Gesellschaft Deutscher Chemiker, where he recently organized a workshop. Nils is also putting his acquired chemical knowledge to good use as he is a volunteer in the fire brigade where he leads a group dealing with nuclear, biological and chemical hazards. Have a look at his poster! Why is the development of X-ray tubes interesting for you? Since my first contact with the field of instrumental analysis, I have been fascinated by the possibilites of developing new equipment and methods to solve complex analytical problems. The most interesting and in my opinion most powerful analytical technique for structure elucidation is X- ray diffraction. One of the limiting aspects of an XRD experiment is the power of the X-ray source. For that reason, huge and extremely expensive synchrotron facilities have been built in the past and are still built. The recently developed MetalJet-based X-ray sources are able to emit synchrotron-like photon flux densities and provide a real alternative to the synchrotron X-ray sources for the home lab. Another reason for my interest in the development of new X-ray sources is that I am impressed by the ingenuity behind the MetalJet source. To use an already molten metal target for fluorescence excitation is as simple as it is brilliant. How does a typical day looks like when developing new devices, i.e. how much engineering and how much X-ray physics knowledge is required? A normal day in my job is divided into two main parts. The first one is the routine service analysis for our customers from the synthetic chemistry departments and to ensure that all instruments in our X- ray lab are working optimally. The second part is the development of new methods and techniques. At the moment, I am occupied with building a single crystal diffractometer with a MetalJet X-ray source. I have to think about possible projects and their implementation. Most tasks start with an idea or a problem to be solved. To get an answer to the predefined question, one has to consider which components are needed. Then comes the question which of them are available locally, which you have to build or which have to be purchased externally. For designing components (e.g. optical benches or radiation shielding) I use a CAD program called Solid Edge®. The program requires a little knowledge about engineering and mechanics. Then the project is carefully discussed with the mechanical workshop staff. After that, the engineers start to manufacture your device and inform you about the process. That kind of cooperation needs a strong interdisciplinary skill between science and engineering. To characterize the X-Rays and Bremsstrahlung spectra of the source some knowledge about x-ray physics and x-ray detection is necessary. Another important task is maintaining radiation safety and its implementation. What was the most difficult problem you had to solve so far during your project? In truth, ensuring radiation protection of such a powerful X-ray source was a huge challenge. The source housing was designed for an acceleration voltage of 70 kV. In our case we are using a generator that is able to provide 160 kV potential. Basically, this means that the highest Bremsstrahlung energy is up to 160 keV. X-rays produced in such a system are very hard which require a lot of lead shielding. To ensure that one is within the dose rate limits demanded by law, one has to check every possible surface of the housing with a suitable dose rate meter. That alone involved several weeks searching for radiation leakages in our setup. How far could one expand the liquid jet technology? Is it possible that, one day, a crystallographer could fill any metal into a liquid jet device and use the corresponding wave length? In principal: Yes it is! The first experiments were undertaken using mercury as a liquid metal target. That was useful to demonstrate that the principal idea works. But there are several disadvantages in the use of mercury, for sure. To use any metal you have to deal with three main challenges. The first one is to liquefy the metal and circulate it inside the source. If you have a metal with a high melting point you will need a suitable heated device which has to be made from corrosion resistant materials. Another alternative is to create an alloy which has a much lower melting point than the pure metals. The second task is having a suitable optic and monochromator for focusing of the emitted X-rays. The last problem is to find a detector which is sensitive for the emitted energy range. If one is able to solve these problems, one could in theory employ any metal in your source and use the corresponding wavelength. Dieser Beitrag wurde unter AK-Junge-Kristallographie abgelegt und mit people verschlagwortet. Setze ein Lesezeichen auf den Permalink.